The report compiled by Palestinian Non Government Organizations Network (PNGO) stated that at present the Israeli prison system holds approximately 6,500 Palestinian Political prisoners. This includes: 300 children, 56 females, and over 500 prisoners under administrative detention. Approximately 870 prisoners suffer from chronic diseases and are in need of urgent treatment. In an opinion piece published in the New York Times on Sunday 16th April Barghouti wrote, "What is it with the arrogance of the occupier and the oppressor and their backers that makes them deaf to this simple truth: Our chains will be broken before we are, because it is human nature to heed the call for freedom regardless of the cost." 1. Installing a public telephone for Palestinian detainees in all prisons and sections in order to communicate with their families. a. Resuming the second visit that was stopped by the Red Cross. b. The regularity of visits every two weeks without being disabled by any side. c. No relative of the first and second level shall be prevented from visiting the detainee. d. Increase the duration of the visit form 45 minutes to an hour-and-a-half. e. Allow the detainees to take pictures with their families every three months. f. Make facilities for the comfort the visiting families. g. Allow children and grandchildren under the age of 16 to visit detainees. a. Closing the so-called Ramle prison hospital because it does not provide the necessary treatment. b. Ending medical negligence policy. c. Making periodic medical examinations. d. Performing surgeries whenever needed. e. Allowing specialized physicians from outside the prisons. f. Releasing sick detainees, especially those who have disabilities and incurable diseases. g. Medical treatment should not be at the expense of the detainee. 4. Responding to the needs and demands of Palestinian women detainees, whether by special transport or direct meeting without a barrier during the visit. a. Accord humanitarian treatment for detainees during their transport. b. Return detainees to jails after the clinics and courts and do not keep them at the crossings. c. Prepare the crossings for human use and provide meals for detainees. 6. Add satellite channels that suit the needs of detainees. 7. Install air conditioner in prisons, especially in the prisons of Megiddo and Gilboa. 8. Restore the kitchens to all prisons and place them under the supervision of Palestinian detainees. 9. Allow them to have books, newspapers, clothes and food. 10. Ending the policy of solitary confinement. 11. Ending the policy of administrative detention. 12. Allow them to study at the Hebrew Open University. 13. Allow detainees to take the Tawjihi [high school] matriculation exams in an official and agreed manner. The Israeli prison system holds women, children from the age of twelve, activists and human rights defenders, academics, journalists and political figures. 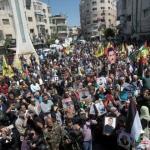 In support of the political prisoners thousands of supporters from across the political spectrum gathered in solidarity in several areas of the occupied Palestinian Territory. Demonstrations were held in the cities of Tulkarm, Nablus, Jericho, Ramallah and Bethlehem. The protestors included hundreds of women, young people, and students demonstrating their support and expressing their solidarity with the struggle of the Palestinian political prisoners. Israeli soldiers fired tear gas and rubber-coated bullets towards the protestors, who threw rocks in the direction of soldiers. Israeli forces suppressed the demonstration in Bethlehem next to the Israeli military base firing tear gas, sound bombs and bullets into the crowd of protesters. Shortly after clashes in Bethlehem, Israeli forces raided the nearby village of Beituniya again assaulting and chasing protesters. At another protest in Ramallah district, close to Ofar detention center, four young Palestinians have been injured. After the announcement of the hunger strike the Palestinian Committee of Prisoners Affairs’ advised that on Monday evening that IPS officials had forcibly moved hunger-striking prisoners to different sections in Israeli jails, confiscated their personal belongings and clothes, converting their rooms into solitary confinements. Palestinian organisations call on the international community to hold Israel accountable for their human rights violations and to ensure respect for international law. They are asking that the international community demand the immediate release of sick detainees; an independent investigation into Israeli prison conditions; release prisoners that were rearrested after the Shalit bargain; hold Israel accountable for the death of Palestinian political prisoners inside Israeli prisons and finally address the issue of Palestinian political prisoners in the international Criminal Court. No one ever enters into a hunger strike on a whim. Rather than defending the legitimacy of Israeli state laws, the hunger strikers are using one of the few means of struggle at their disposal in a state of captivity: using their bodies as a barricade to get a breath of freedom. The brave actions of the hunger strikers is a reminder of the inhumane treatment within the horrendous Israeli prison system for Palestinians and a harrowing reminder of the cruel injustice of the toxic Israeli occupation. At this critical time, it's important that the people of Palestine and Palestinian advocates across the globe stand in solidarity with the political prisoners, as they take on a massive sacrifice, a sacrifice that many who have fought for liberation will know much about.